Catacombs are interesting and often eerie burial places in Italy, and some of the best are in Rome and Sicily. Burials were forbidden inside the walls of Rome as early as the fifth century BCE, so mazes of underground tunnels outside the city center were used to bury thousands of bodies back in the ancient and early Christian eras. Today, some of them are open to the public for tours. 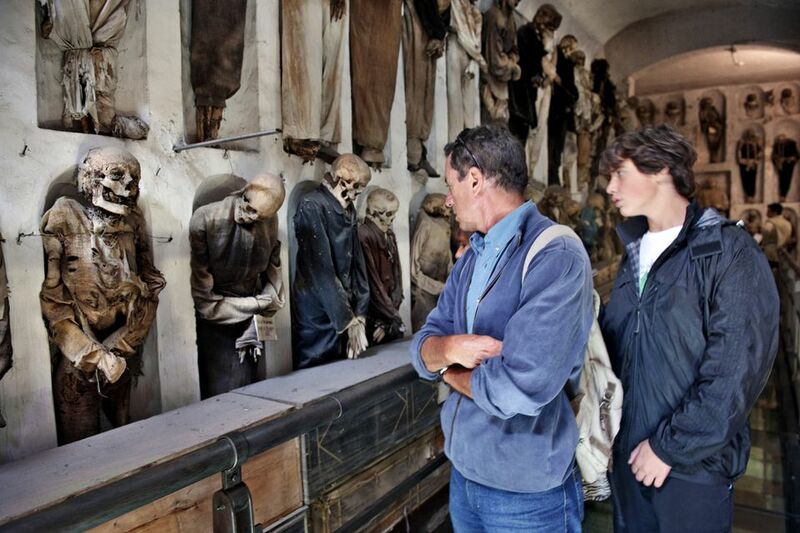 While they may be a little intense for younger children, Italy's catacombs and mummies offer a fascinating glimpse into the country's history. They are usually especially popular with kids from about 10 years old and up. Rome's Via Appia Antica, the Old Appian Way, outside the walls of Rome, was used as a burial place for early Christians as well as pagans. At all of the catacombs along the Appian Way, the bones of the dead have been removed to areas deep in the tunnels, away from the public eye. What you see now are the honeycombs of burial niches which once held bones and in some cases, urns with ashes. Catacombs of St. Callixtus, Catacombe di San Callisto: St. Callixtus, the biggest and most popular of the catacombs, has a network of galleries about 19 km long and 20 meters deep. Highlights of the catacombs include the crypt of nine popes and early Christian frescoes, paintings and sculptures. Catacombs of St. Domitilla, Catacombe di San Domitilla: St. Domitilla has the oldest catacombs, with an entrance through a 4th-century church. Tour groups at St. Domitilla tend to be smaller, but one of the highlights is a 2nd-century fresco of the Last Supper. Catacombs of St. Sebastian, Catacombe di San Sebastiano: St. Sebastian has about 11 km of tunnels but the tour is restricted to a very small area. Highlights of these catacombs include early Christian mosaics and graffiti. Saint Priscilla's Catacombs, Catacombe di Priscilla, are among Rome's oldest, dating back to the late 2nd century AD. They're just outside the center on Via Salaria, another of Rome's ancient roads leaving Rome at the Salaria gate, Porta Salaria, and heading east to the Adriatic Sea. One of the most impressive and unusual burial sites in Italy and probably the spookiest place in Rome is the Capuchin Crypt beneath the Capuchin Church of the Immaculate Conception, built in 1645. The crypt contains bones of more than 4,000 monks, many arranged in patterns or even forming objects such as a clock or chandeliers. You'll find the church, crypt, and a museum on Via Veneto near Barberini Square. Syracuse's catacombs are found below Chiesa di San Giovanni, the Church of St. John, in Piazza San Giovanni, just east of the archaeological zone. The Church of St. John was established in the third century and the Crypt of St. Marcianus lies under what is believed to be the first cathedral erected in Sicily. Palermo's catacombs are found in the Capuchin Monastery in Piazza Cappuccini, on the outskirts of Palermo. While the catacombs found in the Sicilian city of Syracuse are similar to those found in Rome, the catacombs in Palermo are very unusual: Palermo's catacombs contained a preservative that helped to mummify the bodies of the dead. The catacombs contain mummified bodies, many in good shape that still look lifelike, and some even have hair and clothes remaining. Sicilians of all classes were buried here in the 19th century. The last burial here, that of a young girl, took place in 1920. Needless to say, these catacombs, more so than some of the others around Italy, are not recommended for the squeamish or for children. Church of the Dead, Urbania Mummies Cemetery: Church of the Dead, Chiesa dei Morti, is a tiny church in the Le Marche town of Urbania that holds an interesting and slightly macabre display. The Mummies Cemetery, Cimitero delle mummie, is in a tiny chapel. A guide takes you into the chapel and tells you about the mummies on display. Get visiting details in Urbania Mummies Cemetery. The Mummies Museum: The tiny town of Ferentillo in southern Umbria holds an interesting surprise below the Church of Santo Stefano. Bodies buried there were preserved by a rare micro fungus that attacked the corpses and turned them into mummies. Some of the best-preserved mummies are on display in what is now the mummy museum in the bottom part of the church.